The GoSafe 388 is designed to capture the entire road without taking up space on your windshield. 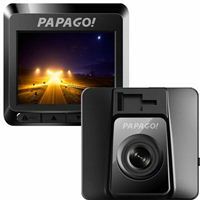 Made with ionized molecular material to prevent bacteria build-up, this micro-sized dashcam records in high quality 1080HD with a 142 degree angle so you are certain to capture everything in your path. The motion detection feature protects your vehicle from any mishaps during your absence while the Stop & Go Light reminder and the Driver Fatigue warning help keep you focused on the road. The optional GPS antenna will help track your location and speed. The ability to record more footage is finally here! The GoSafe 388 is one of the few dash cams that can support up to a 64GB MicroSD card. This allows for much more storage space before it loops over old footage. Record even more important instances with amazing footage and precision. 2.1" x 1.15" x 2.1"